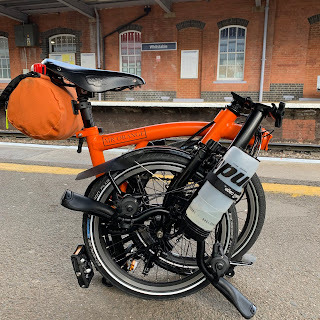 Since going on the Velonotte my beloved Orange Brompton has not ventured out at all! Work commitments have forced me to travel to work by car - something I hate. Tomorrow things are back to normal and I commute by Brompton regardless of weather. I decided to give my bike a clean and it was a good job I did. After the Velonotte my bike was in a shocking state! You can read about in in another blog entry but I can tell you that all it did was rain! I am glad to report that after 90 minutes (with the Wimbledon final on in the background) I now have a bike that is clean again! I cleaned my Brompton this evening. Coincidence. We are not expecting any rain, but we are going to experience a "cold front" - only in the 90s and not above 100 degrees Fahrenheit. So, in a way, I am thrilled. I will try and ride as many days as I can this week.